To make sure that the baby shower that you are intending to throw goes smoothly, it’s mandatory to plan and organize everything minutely and beforehand. Our baby checklist will help you to go through every item needed so that nothing goes wrong in the last minute. 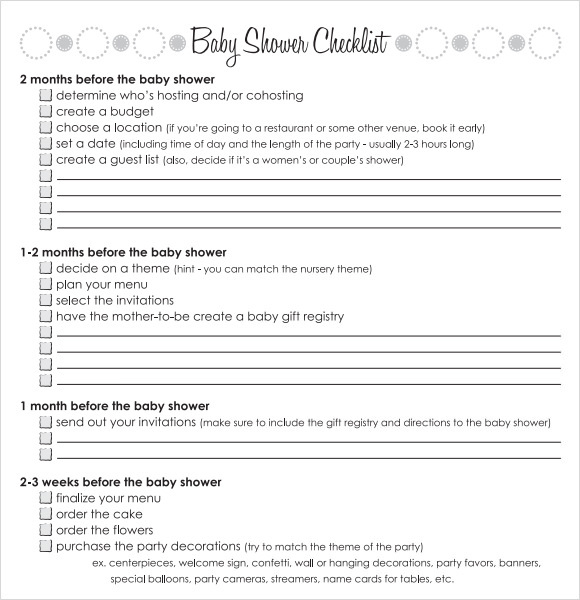 These checklist sample with it’s planned and organized format will let you plan the baby shower with months to spare so that when the time comes you have everything and everyone in hand. Its various examples will let you to draw up a Sample Checklist Templates of your own that’s tuned with the theme of the baby shower. Download and start using them for free! The baby shower planning template allows for an easy and simple to follow method of conducting a baby shower event. The template has time schedule along with list of items that need to be planned and executed before the actual event. 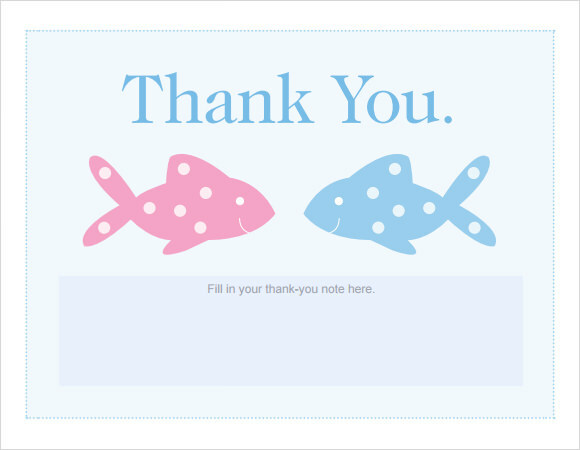 The printable template of thank you cards is an easy and cost effective way of showing your pleasure for coming to your visitors. 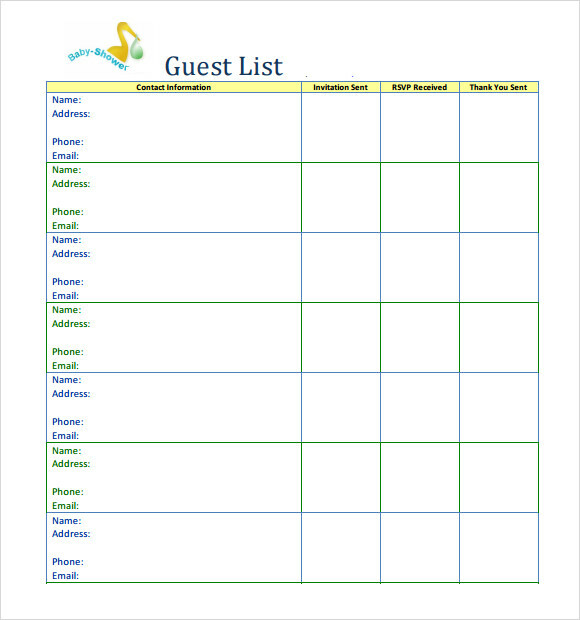 The template has space to fill in personalized messages for your invitees that can be distributed along with the return gifts. 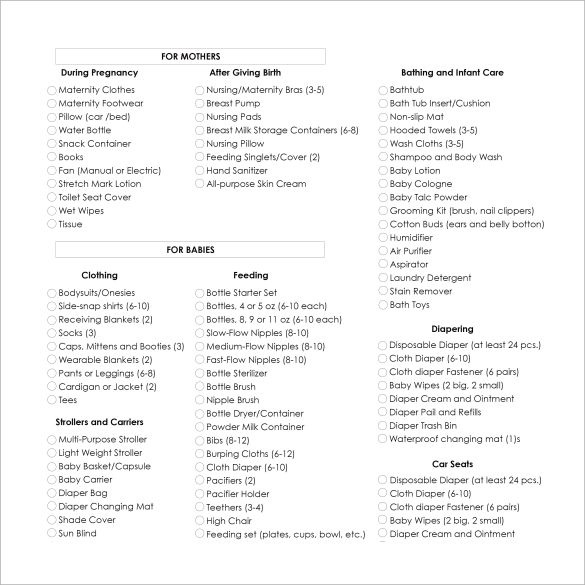 The printable baby shower checklist has a tabular column option along with the list of items that need to be purchased. The time frame beginning from week 5 till a day before the event; the template has it all. This template allows having a complete check on the list of items that need to be purchased before the actual event. The purchase list ranges from return gifts design to catering needs that need can be cross checked every now and then so as to analyze if you are working on the track or not. 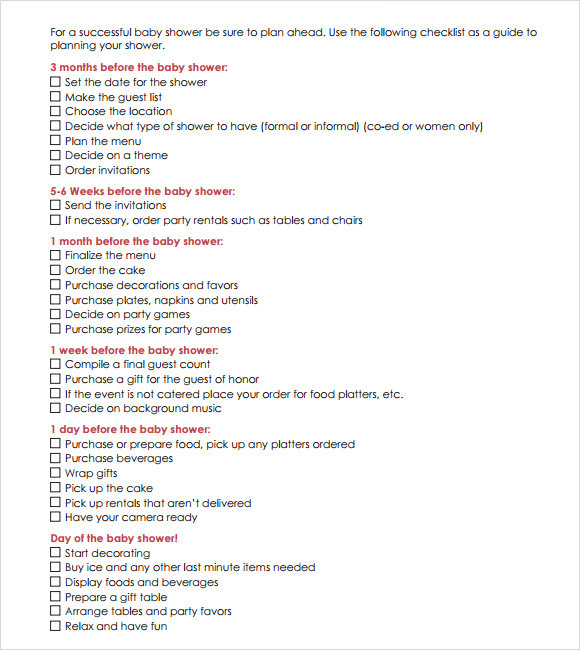 Why do I Need a Baby Shower Checklist? 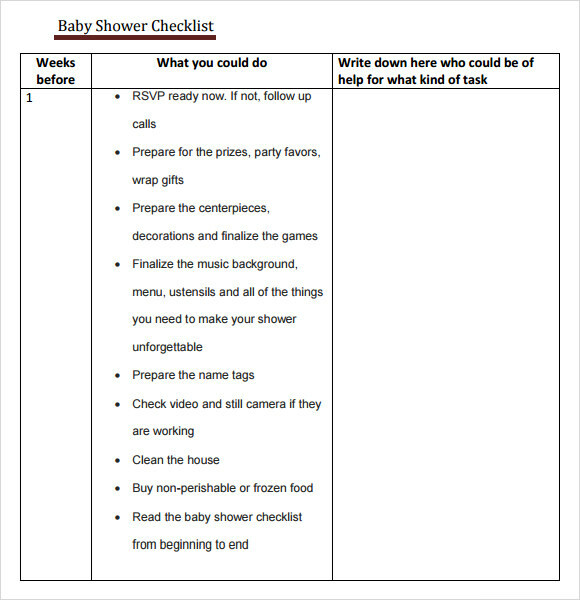 An effective checklist for baby shower will help you have an idea on the amount that will be spend on organizing the event. A checklist offers you with the list of items that need to be purchased or outsourced. Once the list of items such as decor space, catering facility, list of games, host and co-host for the event is finalized, you will get a clear cut idea on the amount spend towards for each of the above. Also, this way you can ensure that the event is running on your budget and that no additional expenses can incur. 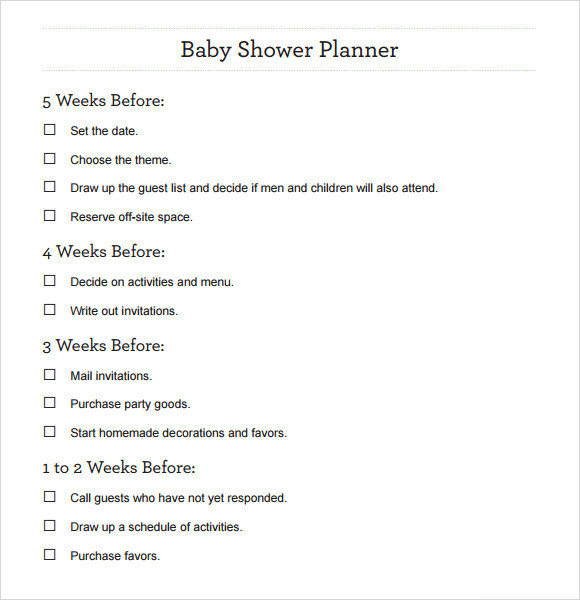 How to Make a Baby Shower Checklist Template? 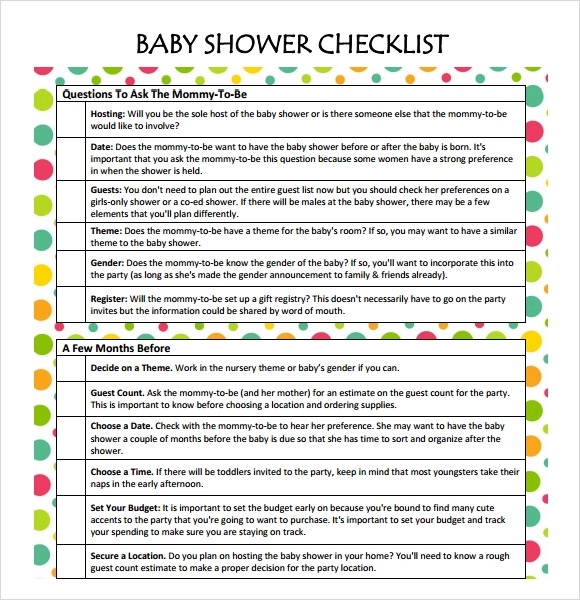 If you are planning for a baby shower event, then it is recommended that you get hold of a baby shower checklist template so as to ensure that your event goes as planned. The beneficial factor of these templates is that the mother to be and father to be gets to spend quality time during the planning phase.